I was late getting to the meeting. “Anytime of the day…” doesn’t really take into account that I had to pass by a doughnut shop and a bakery to get to the church basement. They were just beginning as I came in so I looked over the plate of provided carrot curls, grabbed a cup of coffee and took my seat…. I raised my hand and made my way to the podium. …polite claps ruffled through the group. I look out over the body of like-minded folk and size up the attendees. They’re the same at every meeting. There’s the stoic, self-righteous members…proudly displaying their 100 Loaf buttons… almost militant in the fact that they haven’t bought anything more than pre-sliced loaf bread in 10 years. There are the “good” BHA’ers. The ones that have a grip on their addiction – that only slip…occasionally. The extra ciabatta bun that accidentally makes its way in the bag when they really only needed two… the extra baguette just because they were 2-for-1. And then, there are the bad BHA’ers…. the bread hoarders on the edge… those tormented men and women jonzing to hear the words poolash and limited milled wheat. Their nights harrowed with images of stacks of crusty rye and over-flowing baskets of Pain de Sal. We mean well. We head to the market for our allowance of basic, un-special loaf bread. We intend to only get what we needed.. But as always, we have to pass the bakery department. And there they are.. thick crusts, tender textures, all that yeasty goodness calling us to our doom. And, before we realize it, our carts are filled to brimming with warm crisp loaves and we run… We run as fast as we can to get our parcels home, hiding them in cool dark places so no one will know our horrible secret. The problem with being a bread hoarder of any degree, is that bread doesn’t stay fresh indefinitely. 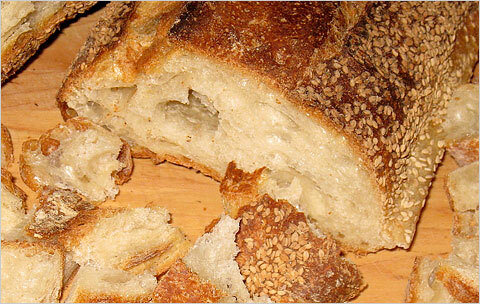 Eventually, you either have to eat it – or – perish the thought, throw it out… and inevitably, bread goes stale. But never fear my brothers and sisters, we are working with stale bread. Today is Panade Day. Delicious soups made with those rock hard treasures, ensuring that you will never…. ever have to part with your beloved loaves again. Panades are bread and broth soups utilizing stale bread. The bread is layered with fillings, cheese and broth.. and baked.We’re going to play with a trio of soups: A Saffron Mourtairol, A Squash Based Broth with Parmeasan, and a take on the classic French Onion Soup. go grab a loaf, a mug of coffee, a scoop of butter… and a muffin.